The Artword Story 1: Why “Artword”? 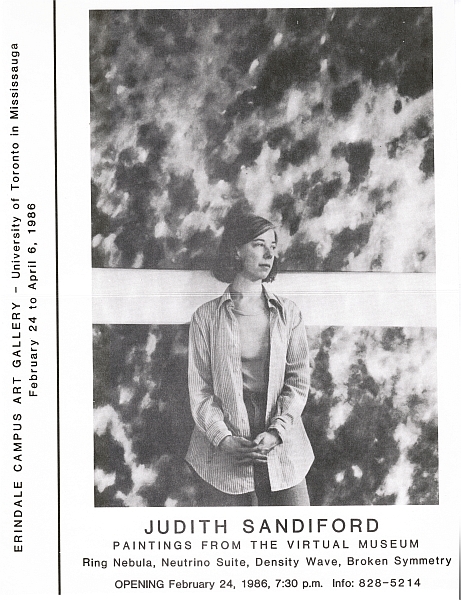 Judith Sandiford paintings at Erindale Art Gallery, 1986. “Paintings from the Virtual Museum”. Judith and I close down Artword Artbar every August and every January. These are times to reflect, re-energize and see some shows that aren’t our own. I also thought it would be a good time to tell you some things you may not know about Artword. “Artword” started as the name of a quarterly magazine, written “by artists for artists“. (Full name “Artword Artists Forum”) Judith was editor and I was the publisher. We published 24 issues from 1989 to 1994. The first few issues were called “WorkSeen”. This was because Judith was an active member of Workscene Collective, which ran the Workscene Gallery. Judith and I had a little business doing technical documentation (still do! ), so we had computers, layout programs, and an actual laser printer, back when they cost $2500-5000. So we had the bat and ball, and the diamond was in our back yard. We were fortunate to gather a team of excellent people, and we made our decisions pretty much together. Our philosophy was that decisions should be made by the people who did the work. And that was pretty much how Workscene Gallery also had been operating. After a few issues, though, we were called to a meeting the Administrative Committee of Workscene Gallery. They had concerns. One of our best, and most reliable writers, who wrote a satirical column called “Le Flaneur” had written a phrase which they considered possibly sexist. It wasn’t, but they thought it might be. The phrase was not “politically correct”, a new concept at that time that was just trying out its wings. They decided that they should review the content of every issue before we published it. So we said no. And they said, well then you have to remove all references to Workseen and change the name. We said fine. We can think of a name. So we thought. And we came up with “ArtWork”. And our designer and layout person, sculptor Lynn Campbell, designed a logo. ArtWork. It didn’t seem quite right. Somebody thought it was too “artist as worker”, too agitprop. But for me, the issue was the letter K. It was a fierce letter, arms and legs sticking forward, a bristling letter. How about (I suggested) the letter D. Artword. Combining Art and Words. And it required minimal redesign of the logo. So Artword it was. Since then, everything that Judith and I have done has been called Artword. When we started our theatre in Toronto, it was Artword Theatre. When we set up our not-for-profit, it was Artword Cultural Projects. And when we came to Hamilton looking to create a theatre, and decided instead to buy a Portuguese sports bar and turn it into a cultural oasis, we called it Artword Artbar. (World famous for its Artword Artbar Artbeer). The name Artword turned out to be a bit problematic. People have trouble reading it and understanding it. The say Artworld or Artwood or Atword or Atwood or (indeed) Artwork. But we have persisted. Artword it remains. This entry was posted in Artbar, Artword, Artword Magazine, Theatre, Toronto, Written Word and tagged 1989 to 1994, art magazine, Artword, Artword Magazine, by artists for Artists, Toronto, Workscene, WorkSeen on July 30, 2016 by Ron.